We are very proud of our state-of-the-art Records Center. A short visit to our Records Center will answer many of the questions people typically have when considering our records management solution. You will see for yourself the security, control and care we will take with your records. If you are interested in the services we provide, give us a call at 270.843.2318 to setup an appointment today. If you are currently using an offsite, mini-storage facility, we CAN lower your cost. Without question, we can store boxes for less money than you can at any self-storage facility! With our Records Management Services, you get lower cost, faster file retrievals, more control and improved security. Once you start a Records Management Program, your inactive records are indexed in our Records Management software, according to department, from and to dates, destroy date, contents description and other characteristics specified by you. As records are received, a computer inventory report is generated for ongoing client reference. Should any record be required, we need only a phone call or fax, and we will deliver that carton right to your desk. Records Management Services will get your records out of your way, but not out of your reach. To learn more about the Accessibility of your records, click here. Our records warehouse is of fire-resistant construction, protected with smoke and heat detectors, and is under 24-hour monitoring. 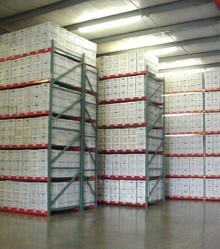 The confidentiality of stored records is assured by our storage systems computerization. Your incoming records are identified and labeled with a code known only to you and us. To learn more about the protection our facility provides, click here. While there is no universal method for determining how long various records must be retained, we are prepared to provide guidelines based on authoritative sources. By establishing such a procedure as a regular course of business, your organization builds a tangible policy that can stand on your side in the event of a disaster or other unexpected occurrence. We survey and inventory your inactive records. We help you develop a records retention and destruction schedule for your organization. We remove records to our warehouse. We destroy records as needed and provide you with a destruction certificate if required. One reason Records Management Services can typically store records for less money than a company can do on their own is our Records Center. We have a center designed specifically for records storage, with racks and shelving for different sized boxes, and security and protection that is ideal for a records storage facility. Our Records Center has racks and shelving that is specifically designed for records storage. We have different shelving based upon the box type and size. The shelving is designed so that records are stored in the best possible manner to ensure durability. Boxes are stacked a maximum of three high to prevent crushing, which would cause permanent damage to any box type. The shelving is spaced both vertically and horizontally to make maximum use of the available space. This allows us to better utilize the facility, which allows us to price storage at the lowest possible rate. Security is of vital interest to most companies and a major factor in their records storage decision. Having records offsite ensures that, should a disaster occur at your location, your records are safe and secure. Records Management Services takes every precaution to ensure that every box stored at our Records Center is as safe as possible. To protect against fire, we have fire and smoke sensors located throughout the building. These are connected to a monitoring systems that will notify the fire department in case of a problem. In addition, to protect against theft and/or vandalism, the same alarm system is monitored 24 hours a day for signs of illegal entry. Our center and office building have motion detectors spread throughout the building. Another added feature of our Records Center is accessibility. 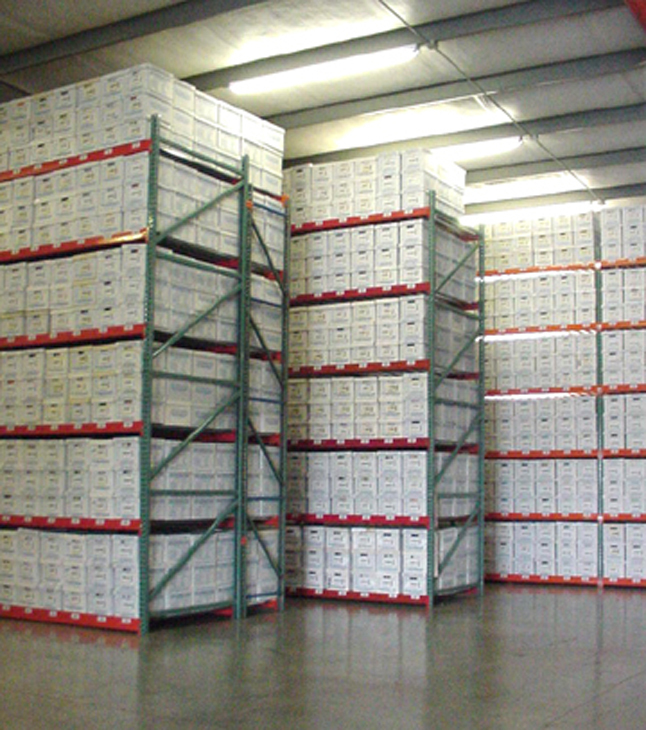 With a self-storage solution, it is often difficult to find the records you need and then retrieve them. Our Records Center is designed to make your records easy to access. Our racking is designed to allow plenty of room between rows. Also, all shelving has specific locations assigned to them. 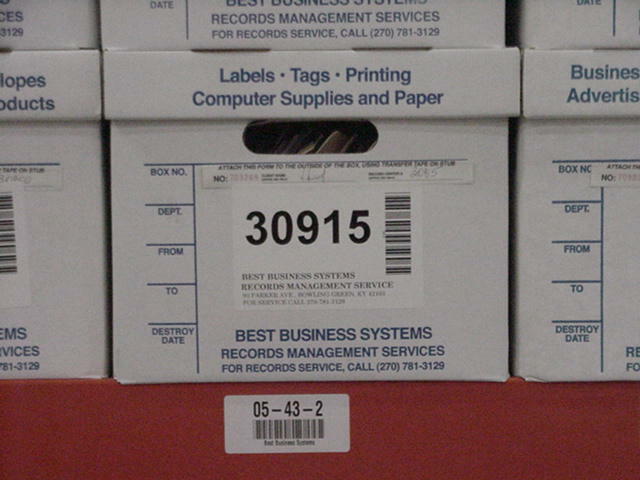 These locations are input into our computer system, and the individual box numbers are attached to these locations so that, should you request a file, we can go right to it and pull it for delivery.